The September challenge for a Year In Reading is to read a book about Sustainability. The new catalog provides 154 hits for a "Sustainable Living" search. Some focus on food, some on general consumption of resources. There's a "Sustainable Living For Dummies" as well as books that paint a doomsday scenario, such as "100 Skills You'll Need For The End Of The World (As We Know It)." 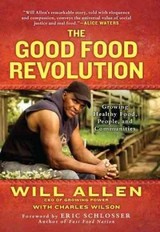 For a more positive outlook, maybe try "The Good Food Revolution: Growing healthy food, people, and communities" by Will Allen. Keep on readin'.